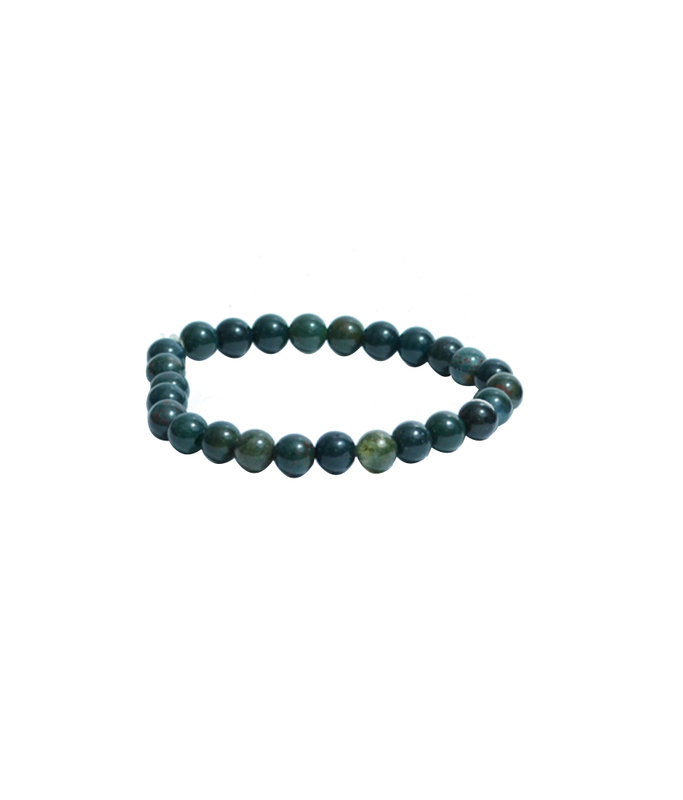 These Energized Semiprecious Bloodstone Bracelet is symbol of strength, courage, purification, and vitality. Bloodstone is a stone of noble sacrifice and the red coloring has been said to be drops of Christ's blood. Bloodstone is a healer for all types of blood and bone marrow ailments, in addition to healing female hormonal imbalances. Bracelets are mainly used to count mantras. The basic function of the mala is to allow one to think about the meaning of the mantra without having to also concentrate on counting the repetitions. Each time the mantra is repeated, the fingers move to the next bead. The mala is generally held in the left hand. One bead is counted for each recitation of the mantra, starting with the first bead next to the guru bead. The guru bead is the three holed bead that is the decorative focal piece. The first bead is held between the index finger and thumb, and with each count the thumb pulls another bead in place over the index finger. Recite one mantra, then move your thumb and forefinger to the next bead, recite the next mantra, then repeat. After completing a full circuit of the mala,the mala is flipped around 180 degrees and continues as before, in reverse order. Mantras can be recited for different purposes linked to working with mind. The material used to make the beads can vary according to the purpose of the mantras used. The mala is used to bring peace and contentment and holds the power that you put into it with your prayers and mantras Disclaimer: These Semi Precious stone/Beads are believed to bring about all the good things. We do not guarntee its success and are not responsible for any claims. Any person with a conditions requiring medical attension should consult a qualified practitioner or therapist. Product colour may slightly vary due to photographic lighting sources or your Screen settings.